Celebrating 40 years of resistance to Lignite Mining in Rhineland the previous Sunday a “Rainbow Action” took place in the forest. 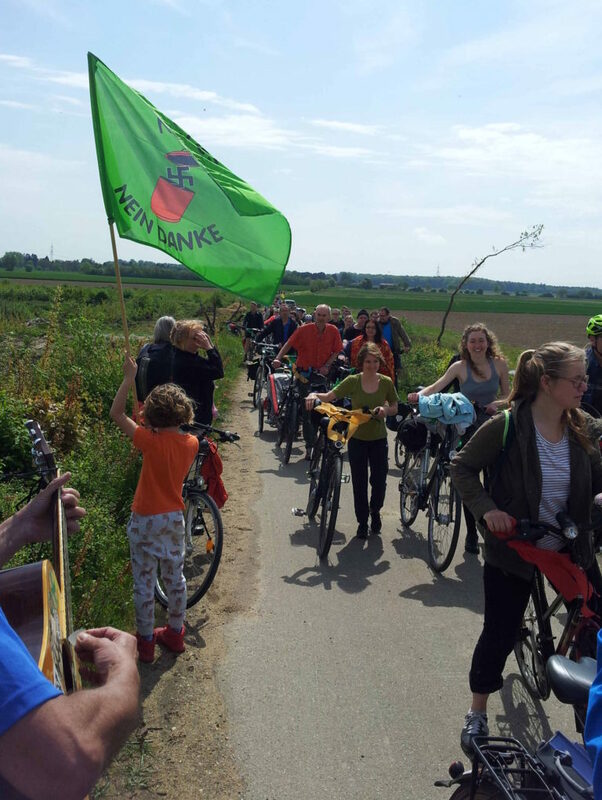 Starting with hundreds of bicyclist converging from both Cologne and Aachen bringing back a cheerful, colorful and busy feeling breaking the Forest monotony of constantly anticipating and dreading large police actions and evictions. Anticipating or denying which has turned into such an art and sport in Hambi that perhaps bets should be taken with the winner who gets the date of next police action right getting as a reward a police baton or helmet from past actions that can be found at ZAD or at many infoshops. Those not guessing right or not knowing would and will be hit with hundreds more batons, sprayed in the face with pepper spray during those more unwelcome visits that could happen today, tomorrow or day after and which more and more resemble large scale military maneuvers and exercises. If the majority had any actual and not just simbolic say in aproving these actions not just everyone in those photos but most of the German and World’s population would choose to have those same resources invested in sustainable and ecological energy transition, re-training, education and not in Climate Chaos imposing repression of present day reality of RWE’s Energie-Reich of North Rhine Westphalia and of German and Global North’s Illusion of Coal Exits and energie transitions, while thermally nuking the Global South and destroying last remaining millenarian habitats left in all of Europe. In the forest the continual insanity if lignite extraction and dumping of over 150 millions of tons of carbon into the atmosphere from the mine destroying Hambi alone and the waves of brutality, arrogance and injustice that perpetuate it, all of it is also beginning to resemble less and less repression as we have known it and more and more feudal hunts in which the local peasants(the police) would form lines and funnel wild animals into awaiting feudal lords, in this case RWE, that would dispatch them with a spear or a crossbow, in our case locking-up and taking out of action forest and climate activists for months and months in prisons in ever greater numbers, stripped of any illusion of a due process while the whole habitat of Millenarian Hambacher Forest is being killed and erased: as if it were a hunting trophy in the Fossil Fuels Planet-wide safari keeping the whole Earth in the cross-hairs and not letting go of the trigger. Slaughtering last of the last while going on an on about either about Cease Fire or about how dangerous those animals really are. These cheerfull and colorful photos are our own distraction from the bleak, gray planet wide cloud of coal dust, its microparticles and carbon, concussion grenades and CS gas and in the Global South of live bullets that is beginning to engulf us and the rest of the planet like the dome of coal driven smog and smoke that now covers most of Chinese cities. None of which would not be possible without the present campaign of Green Scare Propaganda (latest Bild tabloid article with Hambi on front Page “Eco Terrorism out of Control” in which local police chief is quoted as saying that Hambi eviction would take two months) that projects a darker image of ecological activism. This image being more more conducive to keeping climate activists and occupiers of the forest in prison for months without transparent and just(if such thing ever existed incapitalist legal machine) legal process, keeping the environmental groups and experts out of coal exit talks as RWE would like and will get if the climate emergency it is causing will continue to cause more political polarization, more fear based politics and more corruptions and shortsightedness of those in power. Propaganda and lies that attempt to erode this support seen in those fotos, divide one group from another and finally limit the discussion on why so little is done to address this global emergency when so many resources are used instead to attack and imprison those that point out and fight against these systemic problems. If there can be “No Jobs on a Dead Planet” then also all the pension funds, gifts, investments and positions that RWE is offering right and left to influence the status-quo “decision”-making and which it uses to enlarge its Climate-Change-Denying-Idiot-Bubble and to continue to get a free ride and to maintain their planetary criminality and terrorism(giving actual criminals and freedom fighter world over a horrible rap)then all those perks and kick-downs that keep the capitalist machine oiled up and greased up are all pretty meaningless as well. Breathing money can not be any more successful than breathing CO2 especially in a “Culture” that connects one to the other and finances and justifies its own suffocation. As this year started with arctic melting and ice-cover break-up in mid-winter and continues with extreme weather all-time temperature records aready in April and May it will continue with some of the largest police actions in (Post? )Modern Germany putting in place and reinforcing a global disaster that is so extreme, complete, irreversible and unprecedented that it will be especially the children and descendants of those who with wealth, privilege and arrogance are attempting to isolate themselves from this reality who will be wanting the answers the most. The people in the Forest and many of those in those photos will not fall in the category of those that have done nothing or who helped to destroy all hope for stable and livable planet. It has been said that the best time to plant a tree is 10 years ago and the next best time is now. This must be another thing that Fighting Climate Change and trees have in common. Join us then here and everywhere to resist this toxic, waves of scorching heatwaves fueled by fossil fools reality that few would be willing to accept if it wasn’t forced upon the population, and upon those in the forest and those on the barricades with tanks with helicopters, with platoons of cops with dogs and horses and then followed with criminalization and unjust non-transparent prison sentences. Forced by hierarchical patriarchal power structures that manage to convince those they co-opted and sucked into their sphere of influence that they do not have any individual choice, which might be the case but that does not absolve any of those involved from responsibility for their actions. Responsibility that they will have to face in the imminent future of food insecurity, climate destabilization and ecological collapse. Responsibility that they all will have to face especially from those closest to them they are pulling with them into violent and precarious reality in which the weather becomes our enemy and specie after specie vanishes at the fastest rate in the history of this planet, the gretest extinction not the 6th(chronological designation)of Life ever. Hence once again the importace of Propaganda in redirecting the attention from, how State and power structures are imposing a reality of terror, huger and violence on the rest of the planet to focus on activists that are atempting to stop this globally suicidal machine. Einstein said that if bees vanish(rather prophetic statement as colony collapse disorder managed to wipe out most of domesticated bees already) we are bound to follow. It should take no Einstein to guess what the faith and effect of “business as usuall” mentality on this Civilization, on humanity in general, and especially of this Planet as a whole will be and already is if more than half of all species are killed-off, climate turns each year more and more into an unstable nightmare and such vital resources as clean water and air become more and more scarce. On a finite planet not just all good things but also the bad ones must come to an end and how and when they end is decided especially by those who have not buried themselves in the virtual media and industry manufactured “realities” and who for every connection to life and solidarity that is severed forcefully and intentionally form at least two in their place, two that become much stronger than ever before as their importance finally is realized. For the Earth, For the Climate, For Hambi! !